Medieval coin: cut halfpenny of either John or Henry III. Class 5c-6d, 6x or 7a issued between 1204 and 1222. Obverse description: Upper portion of a forward facing bust. Reverse description: Short voided cross with a quatrefoil in each quarter. 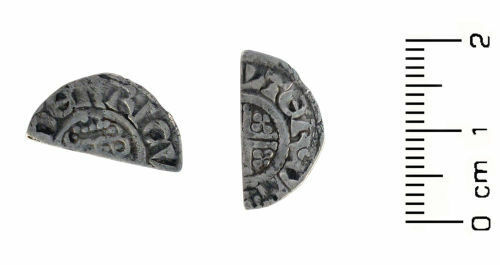 A silver cut halfpenny of John or Henry III dating to the period AD 1204 - 1222. Short cross reverse. Moneyer Tomas. Mint uncertain. Class 5c - 7.